Circus, Circus, or How Pushing Daises is off to a great new fresh start! 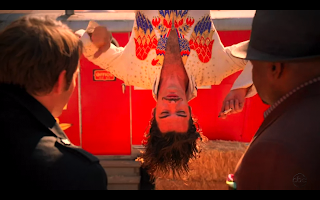 I am so glad Pushing Daisies is back – where else on Prime Time TV do you get a clown-car crash, a murdered mime, booze in bibles, a human cannonball attack and a nunnery pig? I usually find Rachel Harris a bit annoying, so I was glad that she played against type as an emotionally starved and monotone voiced mother. I found it weird at first that I thought the acrobat was attractive – cause I’d only seen him upside down and then later looking all crazy and french: but whoa! imdb quickly made it real that Theo Alexander is a hottie. And I looved the ‘game’ Chuck and Ned played at the end of the episode: the most romantic gesture on TV since Ted’s 2 minute date with Stella on HIMYM last season.